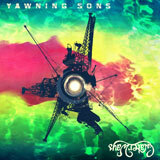 Back in 2009 I had the awesome pleasure of reviewing the first Yawning Sons album. For those who don’t know, the ‘Sons are a unique collaboration between the British avant garde stoner instrumentalists Sons Of Alpha Centauri and the legendary US desert rock act Yawning Man featuring Gary Arce; together they produced the incredible Ceremony To The Sunset which was seven magnificent tracks of ambient instrumental space rock littered with guest vocals from some of stoner rock’s coolest alumni. Here Arce unveils his latest project WaterWays which boasts Mario Lalli, who should be no stranger to anyone familiar with The Desert Sessions, Fatso Jetson and Yawning Man, along with bandate Tony Torney who has played drums for Fatso Jetson since the word dot. With Gary contributing his distinctive and emotive lead vocals on both sides of the disc there is a continuity to this release that many split projects don’t have and the first side is given to Yawning Sons for the single track ‘Garden Sessions I’. Featuring all four members of Sons Of Alpha Centauri on their respective instruments the exclusive track developed as part of the ‘Garden Seasons’ has been re-recorded and expanded for this EP. The result is a continuation of the winding passages of intricate melody that ebbs and flows throughout ‘Ceremony To The Sunset’. The blissful, yet progressive guitar work actually drives the tracks, not the vocal work and the bass and drums act more as a support roll that complements and flavours the piece. As a big fan of the ‘Sons (both Yawning and of Alpha) it is great to hear them flex their creative muscles again. On the flipside Waterways contribute two tracks of self proclaimed/invented ‘Aqua Beat Surf Rock’ to the EP and here the incestuous nature of the project makes sense even more as the chilled rhythms of Torney mingle with the bass work of Lalli to help shape Arce’s vision of this unique project. The three best friends clearly have a telepathy running through them as they play and the joy they must have had creating these tracks reflects in the music. This is the ultimate lazy sunny day EP, even at its meagre running time of eleven and a half minutes, light background vocals, chilled out vibes and complemented by a band with the same ideals and vocals to tie it together. They are ploughing a fairly narrow furrow and in small sharp doses like this it is easy to be left wanting more.